Clark County School District (CCSD) provides a robust supplemental online world language program using Fuel Education’s Middlebury Interactive Languages™ to ensure ample opportunities are available for middle and high school students to take world language courses. Based in Las Vegas, Nevada, CCSD is the fifth largest school district in the country and home to more than 320,000 students in kindergarten through 12th grade—enrolling approximately 75 percent of all K–12 students in the entire state of Nevada. The district includes 360 schools covering 8,000 square miles. With many thousands of students spread out across more than a hundred middle and high schools, it is not practical for every individual school to consistently serve students’ needs for world language courses in the classroom—both in terms of capacity as well as languages offered. The program augments classroom instruction with online world language courses creating a balanced and robust offering to all students. Read how technology-rich personalized learning is bringing about an inspiring transformation of Charles Hamilton Houston Alternative High School in Chicago, IL. 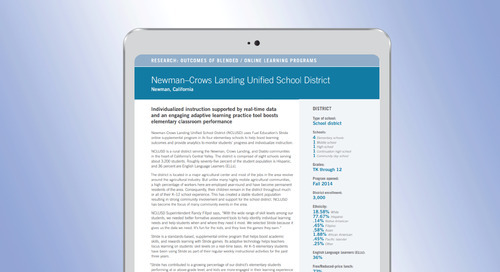 Read how Williams Junior Senior High School in California and their use of FuelEd's online curriculum to try and keep students on track for graduation. Learn about The Independent Virtual Academy in Mississippi in this case study and their results while using FuelEd solutions in their learning programs. with online courses and resources. Carver uses the FuelEd curriculum for all credit recovery instruction and to provide original credit supplemental online courses to significantly expand course options. Using FuelEd online courses, Lacey Online Learning Academy (LOLA) now provides digital credit recovery, AP, enrichment and school-offered courses outside of a traditional class schedule. High school alternative education and credit recovery programs, coupled with quality online courses and great teachers, convince struggling students they can succeed. Quality online instruction, project-based learning, extensive student performance data, and dedicated teachers combine to create a bright future for this second-year school. The Miami-Dade Online Academy provides a comprehensive K–12 public school that could be accessed from anywhere, and allow homeschooled students to learn at any time. New York middle school finds success with online learning tool LearnBop to improve student outcomes in math classes. Online and blended learning programs provide solutions to a Washington community's education needs. Innovation everywhere with FuelEd’s Anywhere Learning System in Walker County.